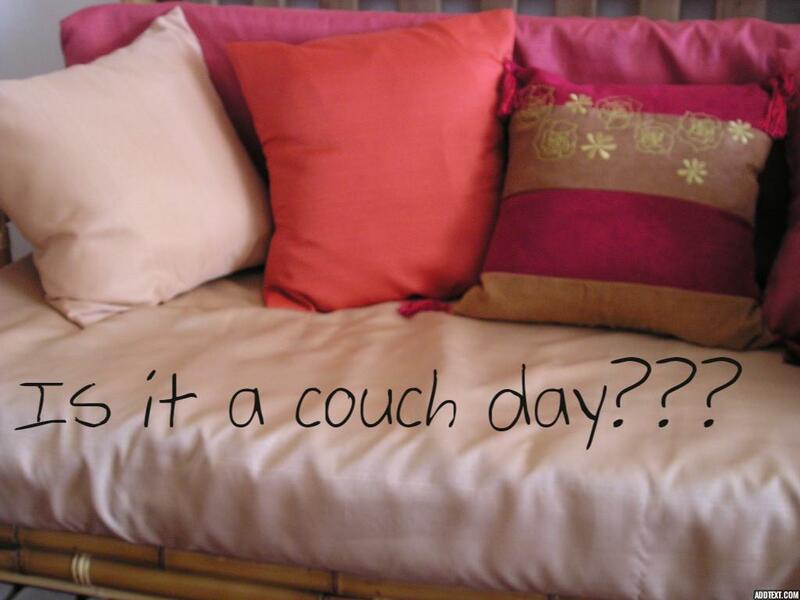 Is it a couch day??? Today, where I live, it is pouring. We all know how weather can effect mood, especially rainy, dark, dreary days. Sometimes it just feels necessary to stay inside, stay in our yoga pants, and do nothing of significance. You know, take a couch day. Grieving is hard work. You grieve 24/7, no time off, no vacation days. Sometimes you have to create the space you need. There are theories that say it is necessary to balance the grief against the not grieving. (Check this out.) And I agree. Most days we are so busy with our lives and we do a great job of wearing our grief mask and just getting through the days. It’s exhausting. So why not take off the mask and be fully you in all your grieving glory. Give yourself permission to have a day that is all about the grief and the pain and the emotional chaos and the physical exhaustion. So…stay in bed and pull the covers up over your face if you want. Don’t take a shower today. Spend the day watching junk television or catch up on all those shows we call guilty pleasures. Sit and cry and look over photo albums. Eat ice cream. Indulge your lazy side. Whatever you want. But only for today. This entry was posted in Coping with Grief and tagged bereavement, bereavement counseling, dual process model, grief, grief and loss, grief work, grieving. Bookmark the permalink. 5 Responses to Is it a couch day??? Lisa so eloquently describes my ‘wallowing days’, though I much prefer the term ‘couch day.’ Thank you for this! In the sea of all of the good days, one of these is needed to keep me going and to allow me move forward. During the first year I kept myself compulsively busy and accepted just about every invitation. I was only able to work two days because of the PTSD but I would run back and forth to my older kids house in an effort to support them during our family’s nightmare. Only in April or May when I decided I wanted to crochet comfort/prayer shawls for other grieving Moms did I start to sit down more as I found I could easily cry and crochet and the crocheting was somewhat calming. Fast forward to now, 2.5 months into year two and I find I am exhausted. Now I really have to self coach myself to get out of bed each day. I have never spent a day in bed unless I am sick, but I am becoming a fan of 30 minute naps. Grief really is exhausting. I probably shouldn’t be admitting this, but I actually wrote to Oprah a few months ago and ask her if she would be willing to open up a retreat for the broken hearted grieving parents. So far, no response so guess we will have to retreat to our own beds. Thanks for the reminder that we need to take more couch days. I know I do. It often takes at least that long for the grief to really catch up, for the reality to penetrate to the core. The running from the pain is a big part of what is so exhausting, then when it catches up with you the pain is the exhausting part! You may find at this point that you need more couch days and that the intensity of your emotion –your raw, at the root, soul-splitting, heart-wrenching emotion –intensifies. Most people seem to think that getting through the first year is the hard part. I think the distraction of getting through the first year serves to intensify the grief during the second year. So…take as many couch days as you need, crochet your guts out (that’s my meditation too! I’m ALWAYS crocheting or knitting. ), cry, wail, rest, and renew as needed.